It was to “shepherds out in the field, keeping watch over their flock by night” (Luke 2:8) that the angel of the Lord first announced, “For unto you is born this day in the city of David a Savior, who is Christ the Lord” (2:11). Why did the angel go to the shepherds first? Was it to make the point that Jesus came to save the worst of society? According to Andreas J. Kostenberger and Alexander E. Stewart, attributing wickedness to shepherds as a class is found in Jewish texts, but these were written after New Testament times (The First Days of Jesus: The Story of the Incarnation, 147). 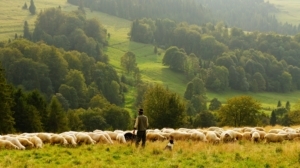 Additionally, the New Testament uses shepherd imagery in a positive way, even describing Jesus as a shepherd (Mark 6:34) and likening elders of a church to shepherds (Acts 20:28; Ephesians 4:11).Therefore, it is unlikely that the reason why the angel of the Lord went to the shepherds first was to reveal God’s heart for the vilest of sinners. Why, then, did the angel of the Lord go to the shepherds first? The angel could have first made the announcement to prominent religious leaders or wealthy inhabitants of Jerusalem (some of whom were eventually saved—such as Joseph of Arimathea [Luke 23:50] and Zacchaeus [Luke 19:1-10]). Instead, the angel of the Lord went to “insignificant” shepherds who were going about their ordinary lives. If you fall into the “normal, non-elite” category of people, here’s “good news of great joy” (v. 10): Jesus came to save sinners just like you! While remaining fully God, he became fully man—that’s the only way he could be our “Savior” (v. 11). Like any human baby, he was born bloody, crying, squirming, needing regular feedings and plenty of sleep. Three decades later, he died for sinners and rose victoriously over the grave. Peter wrote, “He himself bore our sins in his body on the tree, that we might die to sin and live to righteousness. By his wounds you have been healed” (1 Peter 2:24). Have you been delivered from sin’s grip on your life? What you need this Christmas isn’t a sentimental experience highlighted by a family gathering, sugary treats, and the giving of presents. You don’t even need an angel to tell you about Jesus, nor countless angels flooding the sky around you, “praising God and saying, ‘Glory to God in the highest, and on earth peace among those with home he is pleased!’” (Luke 2:13-14). You only need Jesus, this one who came to save farmers, teachers, factory workers, fast-food employees, tellers, the unemployed, even pastors—normal people like you and me. (T)he shepherds said to one another, “Let us go over to Bethlehem and see this thing that has happened, which the Lord has made known to us.” And they went with haste and found Mary and Joseph, and the baby lying in a manger. (vv.15-16). When they found Jesus and his parents, the shepherds “made known the saying that had been told them concerning this child” (v. 17). Who did they tell? Not only Mary and Joseph, but other people as well (v. 18). They couldn’t keep to themselves the truth about the identity of the baby in the manger. Here’s what I’ve noticed about the Christmas season: opportunities to share the truth about Jesus increase. Think about it—what neighbor wouldn’t like a batch of chocolate treats? You could give them a New Testament (or other evangelistic resource) on top of the package as you deliver it. And have you noticed that stores still play Christmas carols? As you are waiting in line, you might start a conversation with the person next to you by asking, “What do you think about this song? Are you okay that it’s about Jesus?” Be courageous! The Lord is with you. And here’s a motivating reality: Jesus came to save non-elite people. Like your neighbors. Like that person next to you in line. Tell them about him. They might be more interested than you would have imagined to hear about the “Savior, who is Christ the Lord” (v. 11).